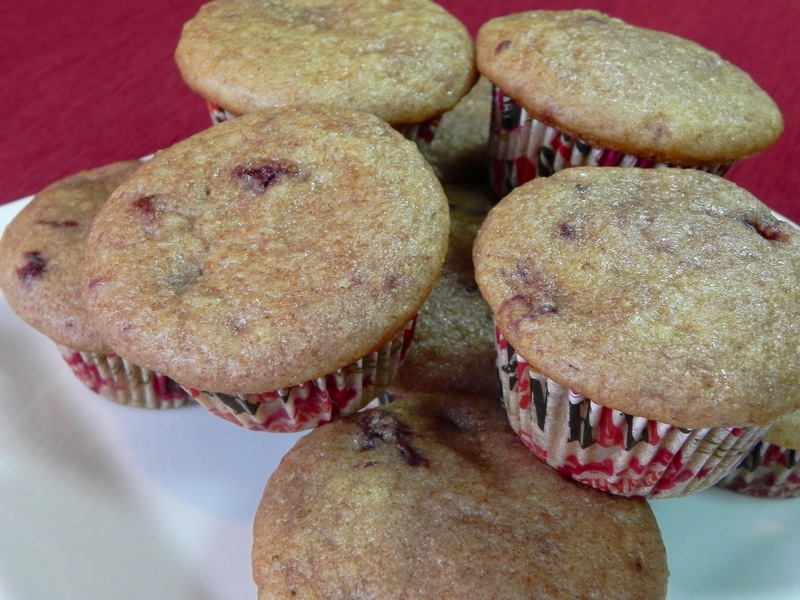 While exploring gluten-free recipes, I came across Bob’s Red Mill Everyday Gluten-Free Cookbook. The listing of gluten-free grains sounded mysterious and exciting. I especially liked the idea of cooking with amaranth because years ago I enjoyed a cereal with that grain in flaked form. The book mentioned popping amaranth like popcorn, and I was hooked. There were many tasty sounding recipes, but the one that caught my eye was a take on the Canadian Nanaimo bar. It had chocolate; it had almond butter; it had popped amaranth. But what it didn’t have was the need to turn on an oven. Therefore, technically, the recipe was not baked. I mulled over whether or not it fell within the realm of this blog. Then I decided I was trying a gluten-free treat so I deserved to stretch the rules. So, this has no high altitude changes because it’s not a baked treat. 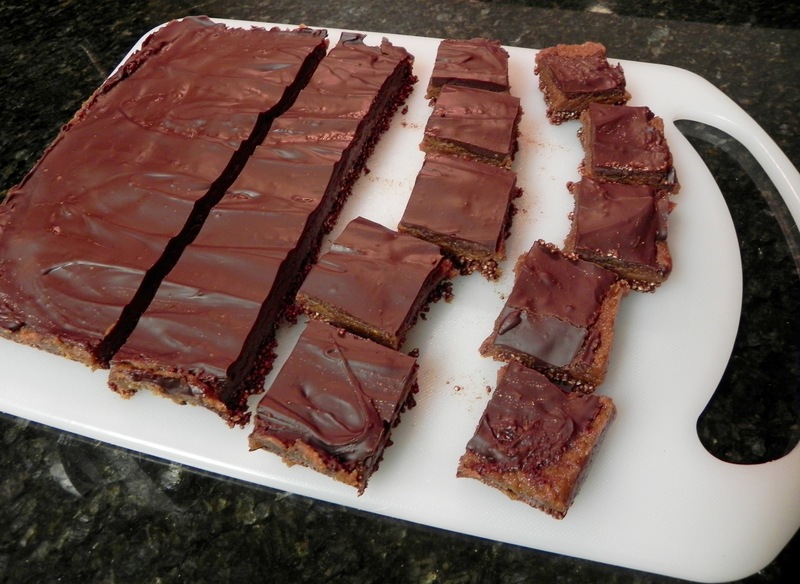 It is also based on a recipe that is vegan so there are no necessary substitutions. I made a couple of minor tweaks based on my tastes leaving the recipe with few changes. But it was fun and it is decadent. And my gluten-free friends can eat it. Pop amaranth by heating a large dry skillet over medium-high heat. Add 1 TBS amaranth and vigorously shake pan for 12-18 seconds or until seeds have popped (they should begin to pop within 1 to 2 seconds after being added to pan); watch closely, as the amaranth will burn quickly once it has finished popping. Immediately transfer popped seeds to a medium bowl to cool. Continue popping until desired amount is reached. Prepare an 8×8” baking pan by lining it with parchment paper, leaving an overhang. Bottom Layer: In a medium saucepan, melt coconut oil over low heat. Whisk in cocoa powder and maple syrup until blended and smooth. Remove from heat and whisk in vanilla. Stir in popped amaranth and chopped nuts until well coated. Press firmly into prepared pan. Cover and refrigerate for 30 minutes, or until firm. Middle Layer: In a saucepan over low heat, melt together almond butter, almond milk, coconut oil, and vanilla. Stir until smooth and spreadable. Spread over chilled bottom layer. Cover and refrigerate for 1 hour, or until firm. Top Layer: In a heatproof bowl set over a saucepan of simmering water, melt chocolate chips and coconut oil, stirring until melted and smooth. Spread over chilled middle layer. 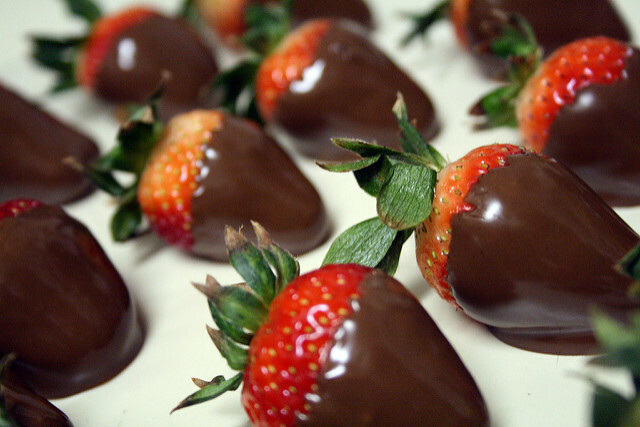 Refrigerate for 10-15 minutes, or until chocolate is set. Using parchment paper overhang, lift from pan and cut into squares. Store in an airtight container in refrigerator for up to 1 week. Until next time, happy baking? Is the Decadent Vegan Baker going gluten-free? When I first moved to high altitude, people were excited to hear that I was making exquisite baked treats that were vegan and worked at mountain heights. Now, with the surge of gluten-free eaters, I am constantly asked if my baked goods are gluten-free. My response is usually a sigh as I haven’t reached that lofty goal yet. In an effort to please several gluten-free friends, I have researched gluten-free recipes. My oven has even seen a test or two. Unfortunately the results have been disastrous. The textures are insanely odd as I have trouble resolving the vegan issues in a high altitude gluten-free recipe. The only thing I have ever baked in my life that went straight into the trash was a high altitude, vegan, gluten-free brownie. It was closer to molten lava than any brownie ever made. But, if you are gluten-free, don’t give up on me. I enjoy a challenge and have started to explore the particular science of gluten-free baking as it pertains to high altitude. I need to wrap my head around that before I can then try veganizing a recipe because eggs provide great structure that gluten-free takes away from a recipe. Also, gluten-free flours don’t react with liquids the same as their gluten-filled cousins do, thus exacerbating the dryness found at higher altitudes. If there is one thing I have learned in adapting my baking to being vegan and being successful at high altitude, it’s that chemistry will always prevail. As long as the various scientific aspects are taken into account, then baking can be a piece of cake, or muffin, or brownie. This recipe was pretty healthy to start, but I upped the ante by swapping some whole wheat flour for white. For high altitude I reduced baking soda and powder but added milk and flour. Then, to keep the muffins from turning pink, I strained the cut up strawberries so their juice wouldn’t color the batter (it will go into a smoothie). Preheat oven to 375°F and line a mini muffin tin with paper liners. In a large bowl, whisk together flours, sugar, baking powder, baking soda, and salt. In a separate bowl, whisk together milk, oil, and vanilla. Gently stir the wet ingredients into the dry ingredients but do not over mix. A few small lumps in the batter are fine. Fold in thawed strawberries. Divide batter between prepared muffin tins, not quite filling the cups. Bake for 10 to 12 minutes, or until a toothpick inserted into the center of a muffin comes out clean. Let the muffins sit for 10 minutes, then remove them from the tin to a cooling rack. Makes 28 mini muffins. Ah, Valentine’s Day and the smell of chocolate is in the air. A traditional holiday treat is truffles and I often make them this time of year. But they aren’t baked and this IS a blog about baking. Fortunately, most of my recipe posts contain chocolate so any would be fantastic for the Holiday of Love. 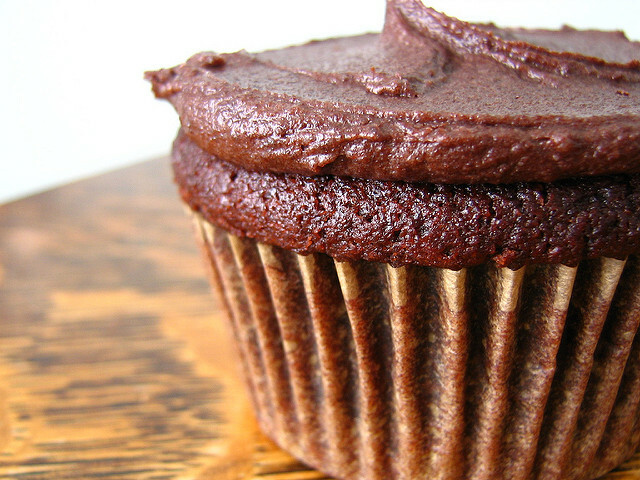 Red Velvet Cupcakes are a winner, as well as Chocolate Mousse Pie, although I would take a simple chocolate strawberry. Both of these ingredients are considered aphrodisiacs so they are right on the mark. I would like to know if you, dear reader and baked treat lover, have any recipes you would like me to experiment with to make healthier. They don’t need to contain chocolate but if they do they will get eaten faster at my house. Is there a baked good that you want to see me adapt?